The St Petersburg airport, one of the busiest and most important airports in Russia after Moscow, will be the place where you will touch down when you arrive by plane in the North-Western part of Russia. 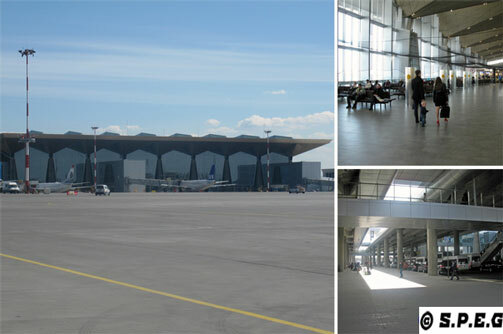 Photo of the new Pulkovo Terminal. Known worldwide as Pulkovo Airport and shortened to LED (airport code), the gateway to northern Russia once consisted of two main terminals located side by side in the south part of St Petersburg: Pulkovo I and Pulkovo II. Today, both of the old terminals have been closed and replaced by a new, modern terminal that is able to compete with the leading European airports and offer a warm welcome to new passengers. With the construction of Pulkovo's new terminal, referred to by the media as New Pulkovo Terminal, the long queues at the entrance or at passport control, as well as the lack of seating and trolleys, are things of the past. Now the city of St Petersburg has a new fully equipped airport built from scratch that offers a capacity of 17 million passengers per year along with an efficient and modern infrastructure, which every Russian is proud of. As a result of that, St Petersburg airport won the 'Best Improvement for Europe' nomination - a prestigious 2014 Airport Service Quality (ASQ) Awards by Airports Council International (ACI). The Awards are granted annually based on the results of a global bench marking program measuring passengers’ satisfaction while they are at the airport. Apart from that we are also sure you would like to know how to get from the airport to the city safely and without hitting your wallet. That's why you are on this page! Isn't it? If so, just keep reading below. Pulkovo Airport is within 23 km of the center of St. Petersburg. From here to town you can take an official taxi upon your arrival at the airport or get a public city bus outside the terminal, or much better, arrange a private transfer before your arrival, and be greeted at the airport. Outside the new Pulkovo Terminal. For your information, going by Russian public transport can be a little challenging for newcomers to Russia and, personally speaking, stressful too, especially if you have a lot of luggage. But it's doable, and of course cheaper than taking taxis or private transfers. Sadly, St Petersburg airport is not yet served by metro or shuttle trains. Now, let's have a look in more details at these travel options we mentioned early. Keep reading below! If you are on a low budget travel, definitely taking a city bus would be the best option for you. With less than one dollar or one euro, you can get to the city, but not to the city center (Nevsky Prospekt), where surely you have booked your hotel. All city buses leaves from St Petersburg airport (outside the terminal) and stop at Moskovskaya Metro Station on the blue metro line, seven stops south of Nevsky Prospekt in the very centre of St. Petersburg. From there you will need to change the metro, so take the red line if your final destination is Nevsky. See the city metro map! What city buses are running into town? You can take the Bus number 39, 39A or the Minibus number K39, also known as Marshrutka. They all run between the nearest Moskovskaya metro station and the airport every 20-30 minutes. Between the three we recommend that you take the Express City Bus number 39A because it is more comfortable than the other two (it has larger seats, better luggage space and air-conditioning). Roughly the service operates daily from 5.30 am to midnight, and tickets can be bought in the arrivals lounges or on board. If you are not on a low budget, then you can take the official airport taxi upon your arrival. It will cost you less than $31/€30, depending on where you go in the city. You can find them in the arrivals lounge at the terminal before exiting. Just look for the marked Taxi Pulkovo! The only downside on taking the official taxi might be the waiting time for the next driver available. This may take from a few minutes to half an hour, depending on the season you travel. As an alternative to the official airport taxi you could also book a city taxi over the phone when you arrive. This would be the cheapest option, although you will have to wait for the taxi to arrive and/or pay an extra fee if you leave the driver waiting for you. Please keep in mind that the majority of drivers from these local taxi company don't speak English and/or don't have any English back up. The average fare for a city taxi to the city center is starting at $20/€16; the price vary based on the type of car and size. The easiest and quickest way to travel in comfort from St Petersburg airport to the city is to order a private airport transfer with a professional driver that will greet you at the airport and wait for you in case of a flight delay, or anything else you have to do, for example change or withdraw money. Our prices range from 1200 to 1700 Rubles (current exchange rate $19 - $27/16€ - 22€). You can book online in advance without prepayment, you just pay in cash to the driver at the end of your run. And, when you book a round trip you get a 5% discount. We strongly recommend that you don't try to negotiate with the drivers touting for fares around the baggage reclaim area, in the arrivals hall and/or on the street. If you go with them you will end up paying something like 3000/4000 rubles (€48/€58-$52/$62), if not more. Usually these random taxi drivers wear a fake official Pulkovo taxi badge around their neck, so they are not legal but just "scammers". A single time I took one of them by mistake, and I was robbed. Overall it was a terrible experience I don't recommend anyone. In the event you rent a car St Petersburg Airport offers several parking options. Gratuities are not a common practice in Russia like it is in US, but if you would like to tip the driver, then a 5-10% for a cab fare is normal. Keep in mind that Russian drivers only accept the ruble as payment option. No credit cards! So make sure you change money before getting into the taxi. Rubles can be obtained either from international exchange offices or from ATM machines both located inside the St Petersburg Airport. However, my best recommendation to you is to go to a local bank which they are all over the city. Usually currency exchange banks are quite competitive with rates fluctuating almost hourly to reflect the Forex market rates, and they are commission free. Below you can check all the arrivals and departures at the St Petersburg Airport, on real time, from and to LED - Pulkovo Airport. As of March, 28 2014 the Pulkovo-2 international airport does not operate any flights and is closed. All flights - local and international - depart/arrive to the new terminal - This means that now there is only one airport (Pulkovo) with one terminal with both domestic and international flights arriving and/or departing. From St Petersburg Airport return to Pulkovo Airport or go back to the Homepage.